Experten in eigener Sache – Menschen mit Beeinträchtigung in der Ausbildung von Sonder- und Heilpädagogen. Sammelband (english) von Jessica Lilli Köpcke (Hrsg. 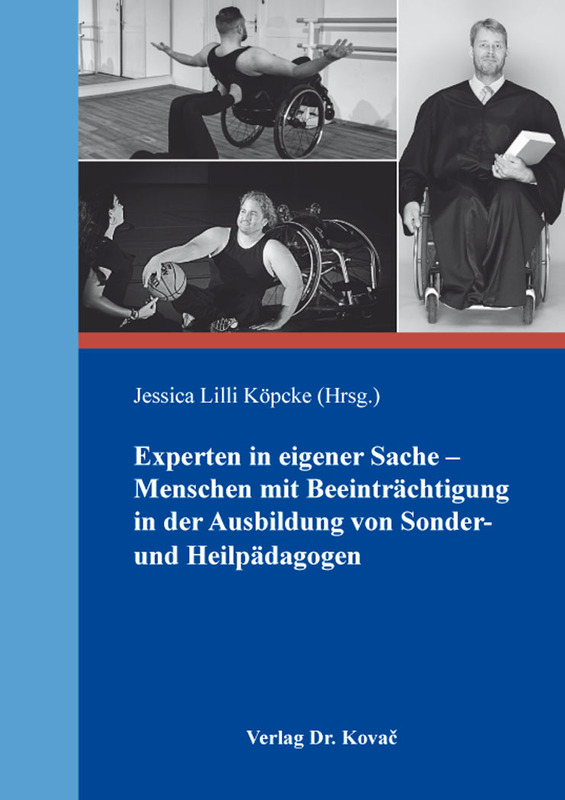 ), Verlag Dr. Kovač 2019, 252 S.
The topics of inclusion and participation and the involvement of people with disabilities in all aspects of life, are no longer marginal issues and are increasingly in society’s consciousness. For the study of special and curative education, this means completely new ways to go and to think outside of existing structures. In many fields of special and curative education, participatory social research has established itself as a methodological research gateway and ensures the inclusion of addressees of these disciplines in research. That means people with different disabilities are not only interviewed, but also included in the entire research process. These ideas are the foundation of a higher education development that takes these approaches seriously. This includes promoting diversity among teachers. The lecturers are not only expert in their fields of study, but also „experts in their own right“. This is an important step in redeeming the human right of inclusion, including people with disabilities. What is politically required and initiated in research, however, is still largely considered an exception in university teaching. In doing so, we know that lecturers, who contribute not only their professional expertise but also their personal history to the fields of special and curative education, generate benefit for students and the inclusive development of college classes. At the same time, students and experts in their own right show the opportunities that this approach offers and the conditions for success that are significant. This project shows also good practice examples of the successful teaching practice of experts in their own right.